Our tongue is a muscular organ of the mouth that has more important uses than people realize. Most importantly, our tongue is needed for our speech, chewing our food and for taste. You can tell a lot about the health of your body by checking out your tongue. What does a healthy tongue look like? There are three signs you need to look out for. Simply look in the mirror, stick out your tongue and check it out for yourself! The best time to check out your tongue is right away in the morning when you first wake up. This way, the results will not be altered by eating, drinking, brushing or talking. Ideally, what a healthy tongue looks like is a light pink color with only a very light white coating present. A bright red tongue could be an indication of vitamin B12 deficiency, heart disorders or blood diseases. Other deficiencies that may be noted with bright red tongue include folic acid and iron. Learn more about tongue diseases here from Wikipedia. A blue tongue may indicate a condition where not enough oxygen supplies the tissues called cyanosis. This may indicate issues with blood vessels, kidney disease or respiratory insufficiency. If this condition is present, it is advised to seek medical attention immediately. Having a yellow tongue may indicate jaundice. This color is uncommon but may be associated with problems of the liver. A purple tongue can be a sign that the heart is not pumping blood properly and may be a sign of heart complications. A common deviation of tongue color is white. A white tongue is most commonly caused by dehydration which may simply be corrected by drinking more water. When the color of the tongue is gray it may indicate an intestinal or long term digestive issue. The normal healthy covering of the tongue consists of tiny little pink bumps called papillae. These small bumps are on the tops and sides of the tongue. They are light pink and give your tongue its rough texture. A healthy tongue can become coated making it hard to notice these normal pink bumps. A thick, white coating is usually an indication of an overgrowth of bacteria. It could be an indication of thrush which is a fungal infection. This is usually noticed after an illness or medications disrupt the normal balance of bacteria in your mouth. This condition is also known as oral candidiasis. Diabetes is sometimes linked to a white coating. It is theorized that with uncontrolled diabetes, there is a high level of sugar in the saliva that fuels the overgrowth of the undesirable bacteria. A brownish/black coating appearing like “hair” on the tongue indicates a condition where proteins turn the normal small bumps into longer strands that appear hairlike. 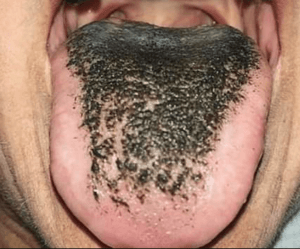 This condition is called black hairy tongue. It is usually brought on by smoking, drinking coffee or tea and poor dental hygiene. Removing the cause, like smoking, and improving hygiene by use of tongue brushing or tongue scraping may be all that is needed to improve this condition. Black coating on your tongue may be caused by using an antacid with an ingredient called bismuth. Certain people experience this when the antacid mixes with the saliva and goes away once you discontinue the medication. What Does the Texture Mean? When normal tiny pink bumps are not present, the tongue may appear smooth and glossy. For some people, this may also indicate vitamin deficiencies including those of all B vitamins, iron or folic acid. Some medications, infections and celiac disease may be the cause of this shiny appearance of the tongue. A condition called geographic tongue is quite common and is noted by smooth patches mixed in with bumpy patches. These patches come and go which is why it is called “geographic” and most times are no cause for concern. Sometimes these patches can become sensitive when eating hot or spicy foods. The tongue is a very good indicator of overall health. While suspected systemic conditions should always be evaluated by your physician, it is also important to always practice good oral hygiene and keep the tongue clean. This includes removing excess plaque bacteria and food debris from the surface of the tongue. This can simply be done by using a tongue cleaner which is a tool that can easily be added to your home oral hygiene care. An effective tongue cleaner will gently and thoroughly remove the unwanted material that may be hiding within the bumps of the tongue. This material includes bacteria and debris and is a known source of bad breath. In fact bad breath will be significantly improved by adding this one routine to your home care. The best tongue cleaner will have a combination of a soft, microfiber bristle and a harder “scraper” to remove the loosened debris from using the bristles. Orabrush Tongue Cleaner from Orabrush has the perfect combination. A tongue cleaner is used to brush and scrape the top surface of the tongue simultaneously for a short period of time (less than 30 seconds is adequate). By pressing down on the cleaner and moving the cleaner from the back of the mouth toward the tip of the tongue you will remove undesirable bacteria and debris. Up to 90% of bad breath symptoms can originate from an unclean tongue. Check Out Your Tongue Today! If you notice anything unusual, please take the necessary precaution and schedule a visit with your physician to be evaluated. By simply sticking out your tongue you can get a glimpse of your overall health. Be aware of what a healthy tongue looks like and take note of the 3 signs of an unhealthy tongue. These include unusual color, coating or texture. I invite you to invest in a quality tongue cleaner to add to your home care and experience improved oral hygiene yourself! I would be happy to answer any questions you may have and please feel free to share your comments involving your own experiences. Thankfully my tongue is brightly pink so I can say based on your article I have none of the mentioned complications. The black hairy tongue is really disgusting, never seen any tongue like that though. I know this is off topic and I duly apologize but I’ve been sores on my tongue and it comes and goes. What could be the cause of this? Thank you for your comment and question. Many times sores on the tongue that come and go are apthus ulcers. This is another name for a canker sore. There is no known cause for canker sores but often times they can be related to an irritation (biting the tongue) or consuming acidic foods and drinks such as citrus fruit or tomatoes. Apthus ulcers can also be brought on by irritating ingredients in toothpaste such as sodium lauryl sulfate. Switching to a product without this ingredient (like Sensodyne) can help. Apthus ulcers may simply be brought on by stress. Rinsing with warm salt water usually helps to alleviate any discomfort from these sores. I would check with your dentist or physician if you are concerned about these sores. Hope this helps. This was a very interesting topic, and very informative. Not many people do take the cleaning of the tongue as seriuously as they should . Thank you for pointing out. I appreciate your comment and questions. The best tongue cleaner will have a combination of a brush and a scraper in one unit. The purpose of this would be to gently loosen the debris with the brush while simultaneously scraping it away. The best product I have found that has microfiber bristles and a scraper is from Orabrush. It is the Orabrush Tongue Cleaner. It does not matter if you use it before or after your normal brushing routine but is best to use each time you brush. Move the tool from the back of the tongue towards the front with a gentle brushing motion and light pressure. Rinse the tool several times while using it until nothing more can be removed from the tongue. This is how you know you have successfully cleaned your tongue. Good luck and please feel free to comment on your improved oral hygiene! Thank you very much, I really gained a lot reading through your post and I’m really educated by the information provided, most especially by the series of color and the possible symptoms or indications. I know the tongue cleaner can be so nice to clean the mouth but what is the effect of mouthwashes on the tongue, can we also use them to wash our tongue in the absence of a Tongue cleaner? I am glad you commented on this article. Many times people are using a mouthwash in hopes of improving the health of their mouths. Mouthwash will not be effective at removing the bacteria and food debris that the tongue harbors. It will simply just cover it up. Only the mechanical action of a tongue cleaner will physically remove this. If you do not have a tongue cleaner, you can also brush your tongue manually with your toothbrush. I prefer the use of a tongue cleaner such as the one mentioned in the article as it includes a brush and a scraper which will remove the loosened debris from the brush on the cleaner. Please refer to another article on this website https://oralprobiotichealth.com which discusses how mouthwash may destroy too much of the necessary good bacteria in our mouth along with the bad. When this happens it can change the microbiome. Hi, I found your article very informative and well written. As you are a dental hygienist, I’m sure you are educating your patients all the time about what a healthy tongue looks like. I’m in the medical field and am often asked by my patients these same questions. One that I come across all the time is when people look at the very back of their tongue and notice large bumps. Of course these are the circumvallate papillae and totally normal, but you may want to include it in your article. I also had never been aware of tongue cleaners. You explained the use of them very well, but would you recommend using toothpaste with it? Also wondering if it should be done twice daily after brushing? I definitely plan to get one. Thanks again for writing such a useful article. Good luck with your endeavors! I very much appreciate your comment and questions. Thank you for sharing the fact that you are also in the medical field. I am pleased to know your patients are asking you such important questions. I would gladly like to inform the public about the circumvallate papillae. These are the large bump like areas on the back of the tongue that every normal tongue has. The tongue is covered with papillae (taste buds) and include 7-10 extra large ones at the very back of the tongue that contain minor salivary glands that aid in digestion. When using a tongue cleaner it is not necessary to use toothpaste but you are welcome to do so. This would be only helpful for taste as it is not needed for cleaning. The actual mechanical cleaning action of the tool is what will remove the bacteria and food debris. This can be done each time you brush morning and night but the best time to use a tongue cleaner is before bed. During the night, our mouths are a perfect breeding ground for bacteria (warm, moist, dark environment). By removing the debris before bed you are greatly reducing the amount of bacteria in the mouth to reduce cavities and promote healthy gums. The use in the morning would be best to improve bad breath. lovely write up. Thank you writer. The brownish/brown coating is really scary as hell because I’ve never seen someone that has the ailments. I never knew smoking and drinking of alcho4 could cause something like this. Thank you Author. This is really educating. Thank you Kehinde for your comment. I would hope more people will take into consideration the correlation of a healthy mouth with a healthy body. After all, they are connected and a look into the mouth is very insightful as to the health of the entire body. I encourage you to have regular checkups with your dentist who can answer any questions or concerns you may have. Thanks for reading!